I never realised how long it actually takes to collect and accumulate finished empty bottles. Even the organisation of where to keep them without accidentally binning them! 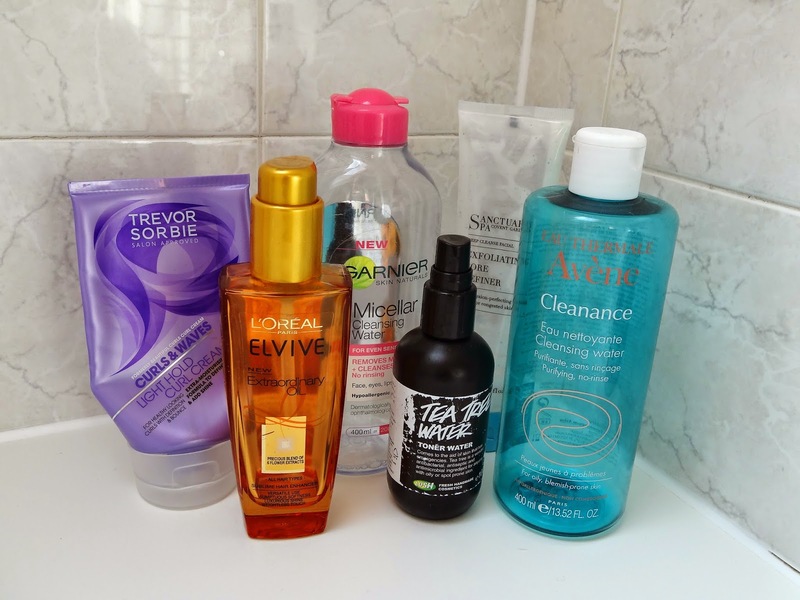 Some of these products I have had for a while and some are used on a daily basis! This is probably my favourite product to use in my hair when i'm having it styled with its natural curl. My hair isn't as curly as ringlets, but when using this product in wet hair, then leaving to dry out naturally it makes my curls well-kept and healthy looking without looking greasey or feeling crispy (which sometimes curl holding products like styling moose can leave. The product smells really nice without smelling typically like a hair product (if that makes any sense?!) No one wants to be stinking of chemicals aha! I would definitely repurchase this product again and again. I think this particular tube in the photograph it's maybe my third tube? There's two variations available for this curl cream. The light version (which i would suggest for those with medium/shorter hair) and the heavier version for those with longer hair and longer layers. This product is an absolute must in my hair care routines. I've gone through numerous bottles of the stuff! 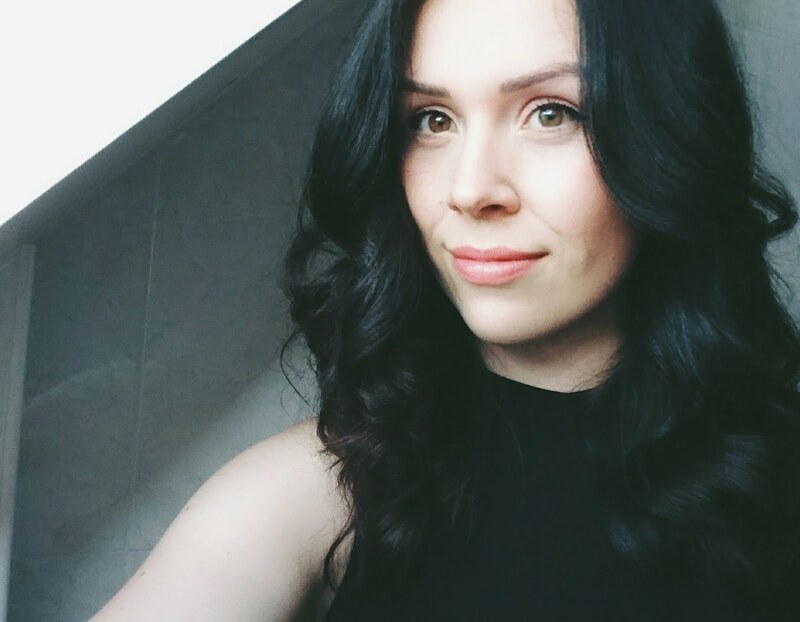 It really nourishes my hair, and for the value it is, I really couldn't recommend it enough! I previously purchased a premium hair serum under the L'Oreal brand which cost me perhaps over double the amount than this one. Even though i'm a firm believer that in some cases if you pay more for something, you get a better result. That is not the case for these serums. The Extraordinary Oil also comes in serveral variations, normal hair, coloured hair, and fine hair. For those of you on the bloggosphere, i'm sure you have heard/read about this product. It used to be compared to the popular Bioderma Micellar water, but won the hearts of many for being a fraction of the price! I use this every morning and every evening in my skincare routine. I wont go into too much detail because i've written a blog post about this a little while back. I love finding out that not long after writing that post, I had my mum inform me that she not only purchased the stuff to use herself, she purchased several bottles to stock up in case she struggled finding the stuff due to the demand and hype! 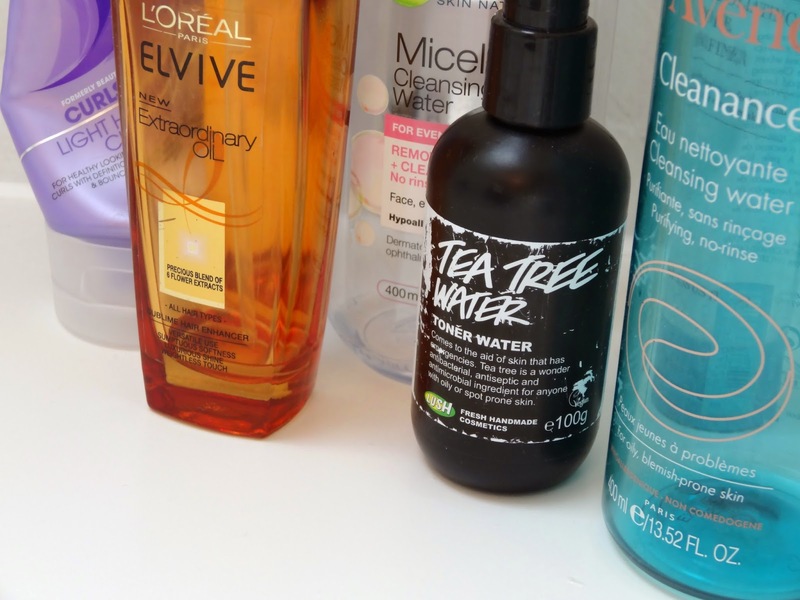 This is my favourite toner to use in my skin care routine! You can tell it's loved by the worn out packaging aha! I enjoy using tea tree infused products on my skin even if I might not actually have spots. I like to think of it as preventing future ones ;) I'm not local to a Lush shop in my area, but next time I pass one i'll certainly be purchasing the large bottle! 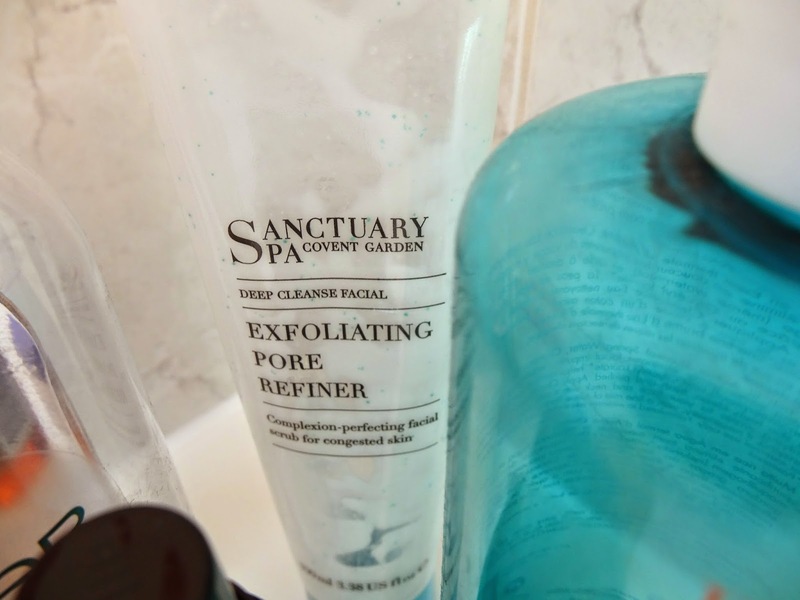 "This facial scrub not only cleanses and exfoliates but also contains eco-particles to gently open clogged pores and witch hazel to help minimise the appearance of enlarged pores." I'd say this does exactly what it says on the tin (tube). I would use this perhaps 2-3 times a week, since the exfoliating beads can feel a little tough on the skin if you over-do it. I think this is a great product, but for the cost that it is, I believe there are other face exfoliants that do the same job (maybe even better?) at a lower price. For something that cost me £16, it's terrible to say that I purchased this by accident. I thought it was something else when I was in a rush one day. I still decided to keep it and finish it off. This is a similar product to the Garnier Micellar Cleansing Water, but about 4 times the price. This is a good product don't get me wrong, but I doubt i'd be purchasing this again, since the Garnier water is just amazing for its cost! Well that's all my product empties for now. Have you used any of these before? What have you finished recently?